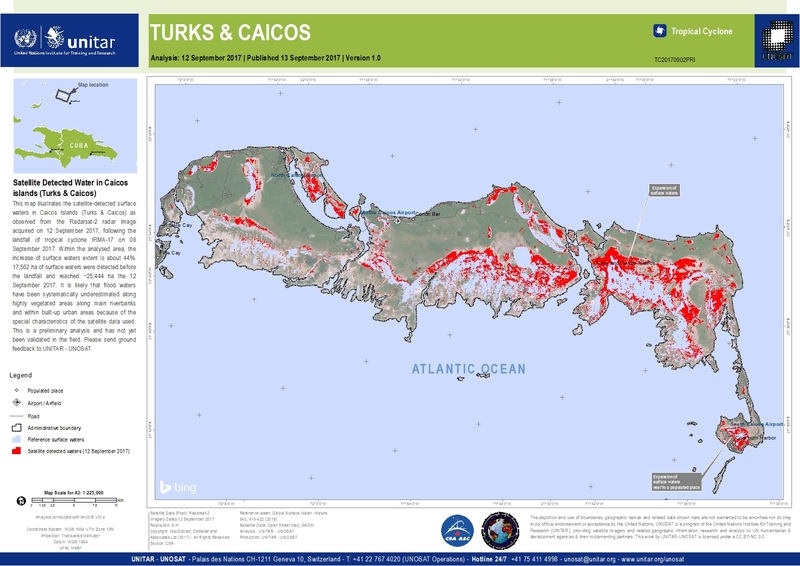 This map illustrates the satellite-detected surface waters in Caicos Islands (Turks & Caicos) as observed from the Radarsat-2 radar image acquired on 12 September 2017, following the landfall of tropical cyclone IRMA-17 on 08 September 2017. Within the analysed area, the increase of surface waters extent is about 44%. 17,562 ha of surface waters were detected before the landfall and reached ~25,444 ha the 12 September 2017. It is likely that flood waters have been systematically underestimated along highly vegetated areas, along the main riverbanks and within built-up urban areas because of the special characteristics of the used satellite data. This is a preliminary analysis and has not yet been validated in the field. Please send ground feedback to UNITAR - UNOSAT.